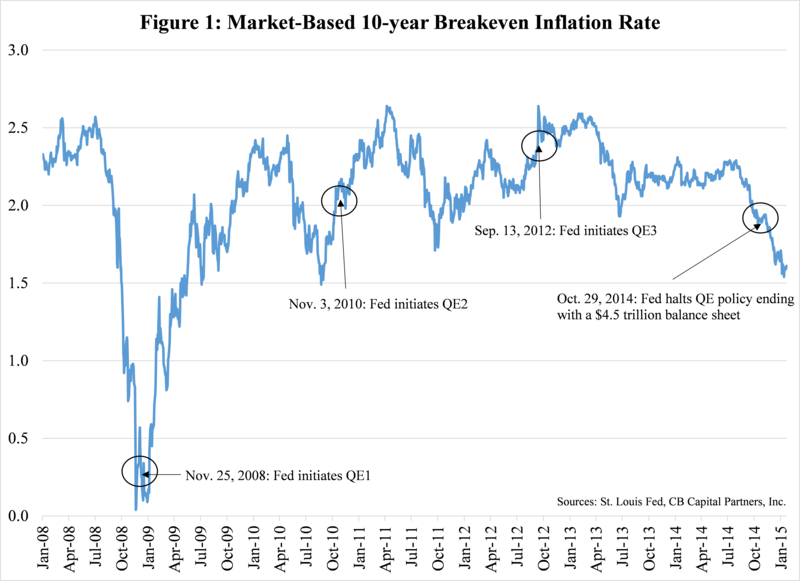 Inflation – CB Capital Research, Inc. Note that the current “arbitrage” between the German & Japanese 10-year (typically done with a “dirty hedge” by hedge funds) with the U.S. 10-year is being taken into account in the above model, to the extent that ECB and BOJ purchases are driving such hedge fund “arbitrage” activity. The reasoning behind our 2016 outlook of 2.5% (the 10-year is trading at 2.54% as of this writing) included: 1) higher U.S. inflation driven by the combination of a tightening U.S. job market, rising U.S. housing prices, and higher healthcare costs, and 2) the peaking of certain deflationary effects around the world, e.g. Chinese CPI was no longer declining while fears surrounding a larger-than-expected Chinese yuan devaluation would turn out to be unfounded. Figure 1 below shows our timing calls on the U.S. 10-year from June 2015 to the present (note the prices of the 10-year Treasury rise as yields decline). In the long-run, the U.S. economy is still limited by the combination of slowing population growth (the current 0.77% annual population growth rate is the lowest since the 1930s), older (and less productive) demographics, and a potential stall in immigration–the latter of which has historically benefited the U.S. disproportionately (immigrants are twice as likely to be entrepreneurs than native-born Americans). Another historic tailwind for the U.S. economy actually peaked in 1999: women participation in the labor force has trended down since 2009. Unless productivity growth jumps over the next several years (not likely; the “fracking revolution” was the last enabler of U.S. productivity growth), the U.S. economy is likely to stall at 2% real GDP growth, especially given the recent 14-year high in the U.S. dollar index–which will serve to encourage import growth and restrict export growth. Note this outlook assumes that the long-term U.S. inflation outlook remains “well-anchored” at 2.0%–should the U.S. Congress adopt a more populist outlook (i.e. higher fiscal spending that is likely to be monetized by the Fed in the next recession), then the 10-year could easily surpass 3.0% sometime in 2017. Since the beginning of last year (see my February 4, 2015 commentary “U.S. Inflationary Pressures Remain Muted” and my March 1, 2016 Forbes commentary “Why Federal Reserve Tightening Is Still A Distant Event“), I have consistently asserted that the Fed’s ultimate tightening schedule would be slower than expected–from both the perspective of the Fed’s original intentions, as well as those of the fed funds futures market. Indeed, the most consistent theme since the beginning of the 2008-09 global financial crisis has been this: The tepid recovery in global financial conditions and global economic growth has consistently forced the Fed to ease more than expected; and since the “tapering” of the Fed’s quantitative easing policy at the end of 2013, to tighten less than expected. E.g. the October 2008 Blue Chip Economic Indicators survey of America’s top economists predicted the fed funds rate to rebound to 4.0% by late 2010. Subsequent forecasts were similarly early. Bottom line: The Fed continues to back off from committing to an official tightening schedule. After the December 14, 2016 rate hike, probability suggests the next rate hike to not occur until the December 13, 2017 FOMC meeting. Until the year-over-year PCE core rate rises to and maintains a rate of 2.0% or over, the Fed will not recommit to a new rate hike cycle. This also paves the way for higher U.S. inflation; as such, clients should continue to underweight U.S. long-duration Treasuries and overweight gold. In our January 25, 2015 weekly newsletter (please email me for a copy), we pushed back our forecast for the first fed funds rate hike (25 basis points) to the September 16-17, 2015 FOMC meeting as long-term (both 5- and 10-year) inflationary expectations in the U.S. continued to decline after the official end of QE3 on October 29, 2014. 80% of all forecasters at the time expected a rate hike by the July 28-29 FOMC meeting. Just a few days later–in the midst of the January 27-28 FOMC meeting–a new CNBC Fed survey suggests that most analysts now expect the first fed funds rate hike to occur at the September 16-17, 2015 FOMC meeting. Our prediction for the first fed funds rate hike is now the consensus. Surveying both the data and the U.S. economy, there still seems to be no rising inflationary pressures, despite a pick-up in U.S. housing activity (due to the recent decline in mortgage rates) and a noticeable improvement in the U.S. job market. In fact, the U.S. CPI–even outside of energy–has continued to trend down over the last several months. E.g. the 12-month change in the U.S. CPI (less food and energy) declined from 1.9% in July to 1.6% in December, while neither the 16% trimmed-mean CPI nor the Median CPI have shown any signs of rising to a level that would justify a new rate hike cycle. The $64 trillion question is: When will the Fed impose its first rate hike, and what does this mean for global asset prices (or the U.S. dollar)? The picture becomes even murkier when one takes into account the recent strength in the U.S. dollar (since we penned our Traderplanet.com ‘Euro Parity” article on September 24, 2014, the dollar has rallied from 1.27 to 1.14 in just a little over four months). Any new Fed rate hike cycle will likely reinforce the recent strength in the U.S./euro exchange rate (note: we now expect the euro to stage a bounce against the U.S. dollar as we believe the Euro Zone economy will surprise on the upside), especially given the open-ended nature of the European Central Bank (ECB)’s sovereign QE policy. I am going out on a limb and predicting either one of the following scenarios: 1) The Fed hikes by 25 basis points at the September 16-17 meeting, but states that future rate hikes will be data-dependent, i.e. a rate hike will not signal the beginning of a new rate hike cycle, or 2) The Fed pushes back its first rate hike to its October 27-28 meeting, if not later. The Fed must understand that capitalism is inherently deflationary. Ever since the Paul Volcker-led Fed slayed the U.S. inflation dragon in the early 1980s, the U.S. economy has consistently experienced disinflationary pressures. This accelerated with the German re-unification and the fall of the ‘Iron Curtain’ 25 years ago, and of course, Chinese entry into the World Trade Organization in 2001. Moreover, with the exception of three short bull markets (World War I, the 1970s and 2001-2008), commodity prices (adjusted for the U.S. CPI) have been on a 150-year downtrend in the United States as U.S productivity growth triumphed over the disciples of Thomas Malthus. Finally, academic studies have time and again proven that there are no consistent reliable leading indicators for U.S. inflation. Common factors cited by analysts–such as M2, capacity utilization, and the cost of housing–all scored poorly relative to a simple auto-regressive (i.e. momentum model). Others, such as U.S. industrial production activity and the 10-year treasury yield, scored better. Surprisingly, the data shows that the rise in food prices have historically been the best leading indicator of U.S. inflation, which we do not believe will apply going forward. Our analysis and our recent trip to four different cities in India has convinced us of this: What China did to global manufacturing India will do to the global services industry. I.e. We believe India–over the next 5-10 years–will unleash a wave of deflationary pressures in service wages across the world as the country builds up its 4G infrastructure, and as its smartphone adoption grows from 110 million to over 500 million handsets over the next 5 years. Unlike other countries under the traditional Asian development model (where a country will leverage its low-cost labor to industrialize and export goods to developed countries, such as the U.S.), India has no language barrier and is well-versed with technology, computer programming, and providing global services already. This is a hugely deflationary force to reckon with and I believe the Fed must take this into account as U.S. service wages (finance, legal, and IT) will consequently continue to be compressed over the next 10-20 years (while tens of millions of educated Indians will join the global middle class for the first time since the 1700s).